With the Yen rallying nearly 10% from intraday low to high in as many days, this breakout is not one to be ignored. Since the Yen has a strong negative correlation with US equities, this inter-market relationship is an important one to keep track of regardless of whether you trade currencies or not. Structurally the Yen has been trading in a seven point range at and below the 2006-2007 lows for the last 15 months. Late last year prices confirmed a failed breakdown by breaking back above the 2005 & 2007 lows, as well as the downtrend line from the 2012 highs. Over the past two weeks prices have accelerated to the upside, providing additional confirmation that this market is headed higher. As long as prices can hold above support outlined in gray (.0082), then the weight of evidence suggests the first upside target is near the 161.8% extension of the late 2014-2016 range and prior support near .0098-.0099. 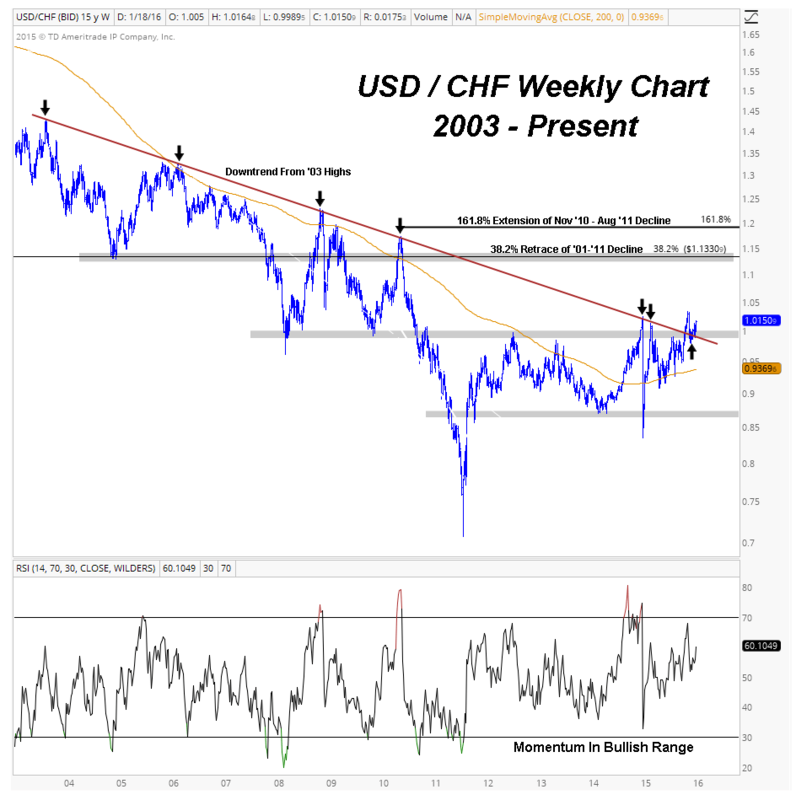 Over the past five years or so, USD/CHF has been laying the foundation for a structural breakout, a structural breakout that looks to be in its early stages as 2016 begins. Before I get into the price action, I think it’s important to understand the context that this move is occurring within. From a sentiment perspective, my data suggests that commercial hedger positioning and public sentiment are both at neutral levels. Sentiment is only important at extremes, which I don’t see currently, therefore this will be the extent to which I discuss it in this post. In terms of seasonality, my data suggests that over the past thirty years, January-March has been the worst three month period of the year for Swiss Franc performance. The combination of these factors provides a slight tailwind for USD/CHF longs in the early months of the year, but overall, this market continues to trade within the context of a neutral backdrop. From a structural perspective, the weekly chart shows the decade-plus long downtrend that this market has been in since prices peaked in 2001. In 2011, prices accelerated to the downside, quickly reversed, and have since been trading within a range of 0.86-1.00. The four and a half year base that formed allowed momentum to improve, the 200 week moving average to flatten out and begin rising, and for prices to test the downtrend line from the 2003 highs multiple times. The development of the conditions which support a sustainable rally allowed for prices to break out late last year, retest the breakout, and continue higher. If this breakout holds, the first structural target lies near 1.13-1.14 at prior support and the 38.2% retracement of the 2001-2011 decline, which represents roughly 12% upside from current prices. First of all, I want to say that the purpose of this post is not to make predictions about the future, so if you’re expecting a 12-month price target for the S&P 500, you’ll want to look elsewhere. Throughout this exercise I used the weight of evidence present in markets around the globe in order to identify some market themes that I think will occur throughout 2016. Lastly, I want to say that none of these market themes are set in stone. As a market participant, I’m not here to be right/wrong, if/when the weight of evidence changes I’ll adjust. Without further adieu, here are the nine market themes for 2016. Since the SPY / EEM and VEA / VWO ratios bottomed in 2011, they’ve been on a complete tear, representing the broad outperformance of stocks in developed markets over emerging markets. These ratios developed multi-year bases and the breakouts from them were quite explosive. Despite their aggressive rallies, there is little evidence that suggests they’re ending anytime soon. There is evidence however, that their progress may be due for a bit of a pause in 2016. The SPY / EEM ratio is approaching the 38.2% retracement of the 2000-2010 decline, which also corresponds with prior support near 6.7. In addition, momentum has negatively diverged at the recent highs, which has preceded pullbacks or consolidation periods in the past. Structurally this uptrend looks great, but we may see some consolidation this year before it breaks out to new highs. Similar action is occuring in VEA / VWO as it approaches the highs it made in 2008. Despite the strong structural uptrend, momentum recently diverged as the ratio made new highs, suggesting a pause may be needed. Our structural target remains the 2008 highs, which also corresponds with the 161.8% extension of the 2014 correction. Despite this continued outperformance, I’d expect to see some consolidation in this ratio before it makes new highs. Over the past decade or so, the ratio of large caps stocks to small caps stocks (SPY / IWM), has been forming a major base and is starting to break out of it. If the ratio can clear 1.80, then 1.95 is the next big level of resistance. If this ratio can eventually get above 1.95 there is room for a lot of potential upside. I’m going to continue to watch this chart throughout the year as I think this may be the start of a much larger / longer-term trend. And this could be one of the major market themes for this year and perhaps years to come. This doesn’t necessarily mean another big down year for the group, it could very well mean a flat year. Many of these markets in strong structural downtrends or trendless markets, meaning that time will be needed for them to reverse / sustainable uptrends to develop. That doesn’t mean that there won’t be counter-trend / mean reversion opportunities to take advantage of over the year, but it does mean that we shouldn’t be expecting strong multi-year downtrends to reverse themselves in a relatively short period. Time heals all wounds, even in markets, but we have to be patient to allow sustainable trend reversals to take place. A good example of this is Crude Oil. Many commodity charts have been more or less crashing below downward sloping 200 day moving averages for years. Sure, some counter-trend opportunities presented themselves in 2015, but the structural trend is still in place and will take weeks / months / years for these trends to change. If you have read my BIO or have seen my blog posts before, you may know that I use technical analysis to apply a top-down approach across all asset classes globally with the intention of identifying trading and investing opportunities. Before I outline my trading plan and full-blown approach to markets in another blog post, I thought it’d be appropriate to define what a Top-Down Approach looks like. Hopefully by the end of this short post you will have a high level idea on the way I choose to analyze markets and an interest in exploring it further for yourself. As a technician, I have the ability to look across all asset classes as long as there is enough liquidity and price data to do so. When the media is saying that it was a boring day/week/month on Wall Street, I often chuckle as they are so caught up in what the Dow is doing that they missed a huge move in the Australian Dollar or Oat Futures (yes, you heard me correctly, Oat Futures). The main objective of this step in the process is to identify what asset classes I want to be involved in on a relative basis. If commodities are acting well and there is little action in equities or fixed income, then I want to be focusing on taking advantage of the opportunities in commodities. After I have identified which asset classes I want to be involved in, then I can identify what themes I am seeing across markets. For example, with sentiment towards Treasuries hitting extremes to start the year as well as the defensive nature of sector performance in equities, one could conclude that the market thinks that rates are going to stay lower for longer than most people are expecting. That is just one example of a theme I’d be looking for, but there are plenty of other themes out there that can and will develop depending on the time-horizon. After I have identified the asset class I want to be involved in as well as a broader theme present in the market, I can then drill down into individual securities that I feel are best positioned to take advantage of the identified theme. For example, in the case of rates staying lower there are a variety of ways to take advantage of the theme ranging from owning treasuries, other fixed income securities, or the defensive sectors of the equity markets. In many cases it is possible to drill down even further into a specific sector to find an individual name that is outperforming in that sector as well. In the case of rates staying lower, Duke Energy (DUK) was a good example of an individual security outperforming the broader market and the sector as well. For some, owning the utilities ETF may have been a more diversified play for them, but for the more aggressive market participant, selecting an individual security within that sector can provide additional returns; granted with more risk. The last step in the process is portfolio management. After determining the asset class to be involved in, the broader theme to play, and the individual security to play it with, then it is time to manage the portfolio of positions. This step includes everything from position sizing, correlation management, liquidity management and any other factor that’s built into your trading plan. That is a high level look at what a Top-Down Approach is all about. Hopefully you learned something and are interested in exploring the topic more on your own. If you have any questions, comments or concerns, please feel free to reach out to me. Until next time. In business school, two of the core principles taught in intro finance courses are the time value of money and compound interest. Grasping these concepts is crucial in understanding the importance of beginning to invest as early as possible. Most people are familiar with these concepts but do not have a formal definition or framework for understanding them. 1. Time Value of Money: The idea that money at the present time is worth more than the same amount in the future, due to its potential earning capacity. In simpler terms, $20 is worth more today than $20 a year from now, because I have the potential to earn interest on the money I receive today. The key takeaway is that provided money can earn interest, any amount of money is worth more the sooner it is received. 2. Compound Interest: Interest calculated on the initial principal and accumulated interest, or in simpler terms, “interest on interest”. Now why does this all matter? Well, all of us are going to have to retire someday, some of us sooner than others, but without knowledge of these key concepts we’ll all have a tough time getting there. For the example below, imagine that you are investing $5,000 annually in the S&P 500, which has returned roughly 9% annually since 1928. For the sake of this calculation we will assume that the initial investment account starts at zero and that the $5,000 investment will be made at the end of each year. As you can see by the first column, a mere $5,000 invested annually grows to roughly $1.7 million dollars over forty years. I know, I know, adjusted for inflation the number will be lower but the principle I am trying to illustrate remains the same. The second and third column show the investment return over thirty and twenty years respectively. As you can see, with only 10 years less time invested, the investment return is over $1 million dollars lower. Investing over twenty years yields a mere $255 thousand, still a significant amount, but much lower than what could have been had the investment had more time to compound.